Documentation for the product has been released. 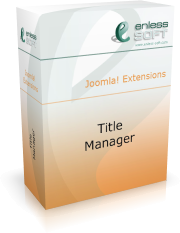 We have finished our first version of the documentation of Title Manager. Currently, it is only available in Microsoft Help format (.chm), but it should be available in HTML format shortly. It might still need some polish but we hope it will be useful to you. The documentation contains both User’s Guide and Developer’s Guide.